When I reached home yesterday, I saw my two kids donning Halloween hats. 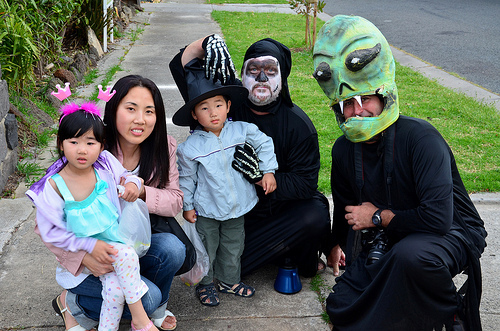 My wife bought these hats after being informed by the childcare centre of its Halloween activity two weeks ago. She said it was fortunate that she had bought some sweets anticipating that these may come in handy. Indeed, all the sweets were given out. When she drove past 180 Maidstone Street that I had mentioned in an earlier post, she saw many people congregating there. 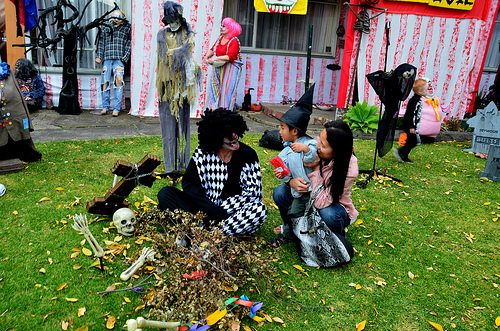 Putting aside the dinner preparation, we decided to make a visit to the house to experience the Halloween festive atmosphere. Both sides of the road were parked with cars and more cars continued to arrive, bringing in families and lots of kids. 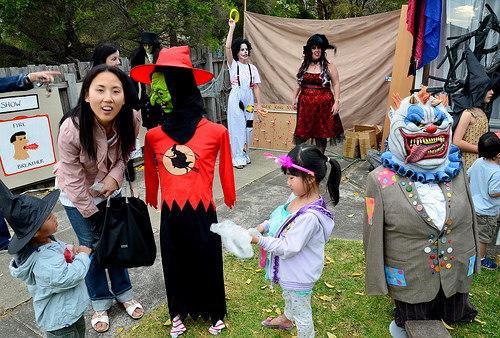 Many people were dressed in ghoulish and fanciful costumes, masks and makeups. Not only were the children having fun, the adults were too elaborately dressed (like in the photo above) and apparently enjoying themselves. I was expecting to see at 180 Maidstone Street what I saw several days ago. However, a surprise was in store for me. There were considerably more “props/statues” and also real people masquerading as stills and props. 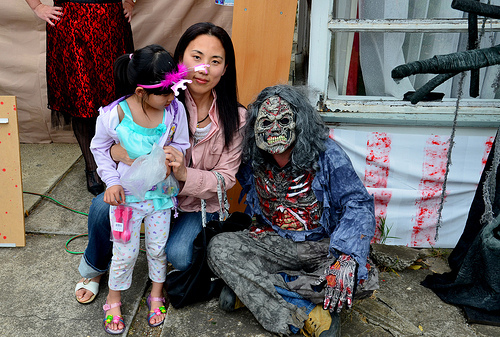 For example, had the zombie (in the above photo) not moved, I would have thought it was a dummy. 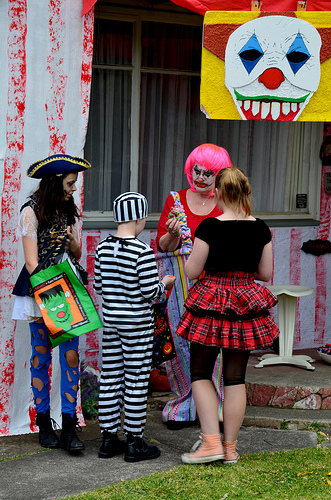 Not only were the hosts handing out sweets to the kids, they were also giving away “prizes“. Just throw a ring and regardless of whether it loops onto a stick or not, you will get something. My two kids each received a 12-piece set of children forks and spoons. I guess the hosts must have spent quite substantially on the decorations and the gifts just to give everyone a memorable Halloween experience. 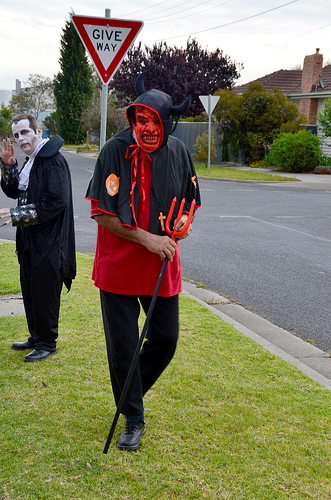 The Halloween spirit seems to have spread to other houses in the neighbourhood. 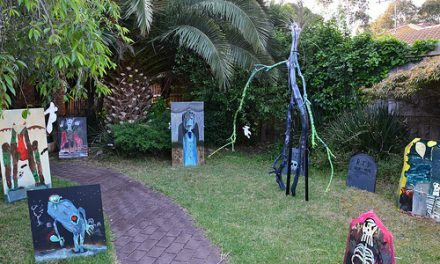 Directly opposite across the road is another house that littered its entire front gardens with pumpkins, witches, tombstones, skeletons and so on. 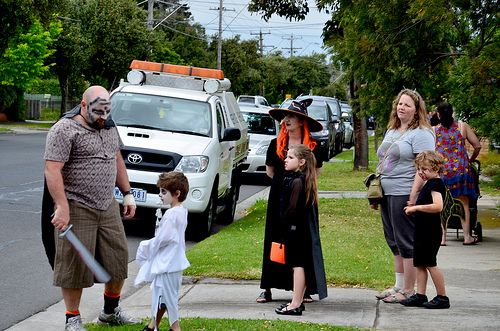 We were directed to walk along a footpath specially constructed on the lawn, bounded by wooden planks on both sides and winding around the artefacts to the porch where the “witch” was handing out sweets to children. The popularity of fantasy movies such as the Harry Potter, Twilight and Lord of the Ring series have helped to endear children to these spooky stuff. Maidstone Street was flanked with groups of people and there was considerable human traffic on the pedestrian paths. 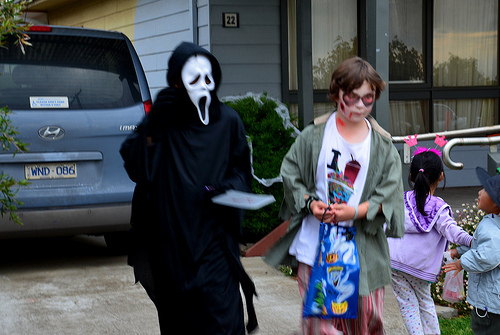 The kids were carrying pumpkin lanterns and were equipped with special receptacles to collect the sweets and chocolates that they amassed door to door. 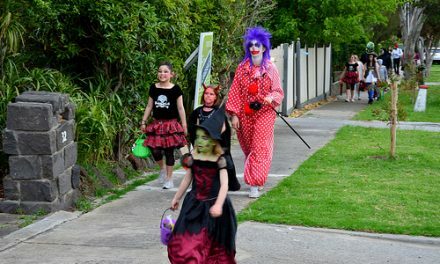 I had observed that by putting out balloons in the front yard, a particular household is indicating that it is participating in the trick-or-treat activity. 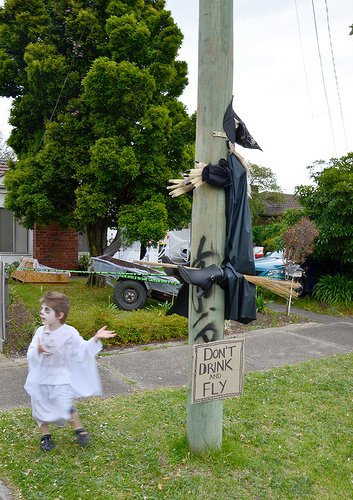 Someone came out with a great idea of tying a flying witch to a roadside electricity pole. This naturally caught the attention of many people and became a popular target for photo taking. The caption “Don’t drink and fly” is very creative too. The witch must have too much of a booze after partying and knocked onto a pole while flying home. We decided to be part of the “groups” and followed the flow of human movement into Galvin Street. 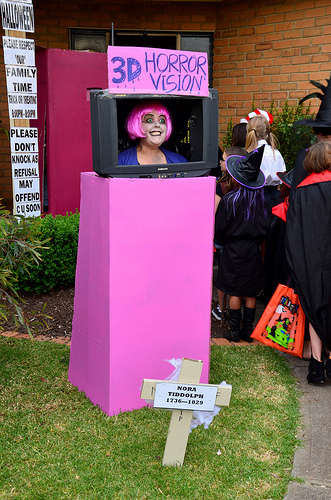 The house at the corner of Park Parade and Galvin Street had a Living Statue in a pink box. The motionless pink-haired lady would suddenly scream when children passed by her. It was 7 pm+ and time for dinner so we decided to make our way back to the car. Before heading home, we drove around Altona to check out if there were similiar activities in other parts of the suburb. There weren’t any. 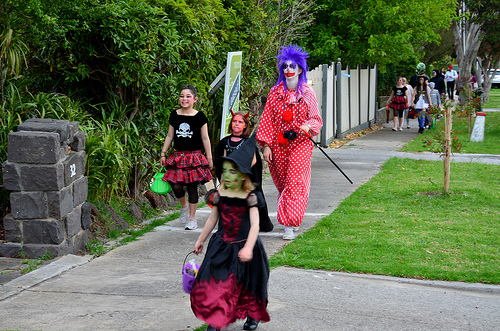 So the Halloween buzz appears to be confined to the area north of the Mount St Joseph Girl Secondary School. And it was much bigger this year. I do not know how this came to be. Could there be some neighbourhood groups that coordinate these activities? 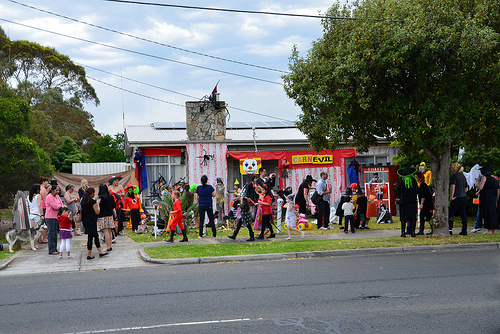 Or could the Halloween decorations initiated in one house spark the interest and emulation from neighbouring households, like the Christmas lightings in Markham Way, Altona Meadows. If there’s something strange in your neighborhood, who ya gonna call? Ghostbusters! 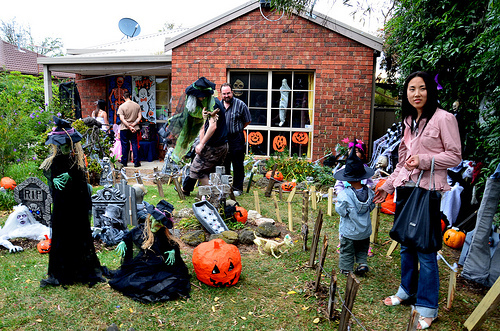 Anyway, thanks to the generosity of these neighbours, we had a great day. Our two kids had come home with a bounty of sweets. We had also experienced the friendliness and warmth of the local community. Going door to door and interacting with people that you do not know is something that does not usually occur and is something amiss in the neighbourhood even during more festive celebrations such as Christmas and Easter.